Communities across the country have opened their arms to Antigravity over the years. We seek to honor these invitations by engaging the communities we present in, and audiences we perform with, in our evolving process. We offer free tickets, workshops for schools, workshops for professionals, talkbacks, and lecture-demonstrations of work-in-progress. Antigravity makes the commitment to offer free tickets to all of its work. Dear Diary LOL was free to the public in the 2017 FringeArts Festival. 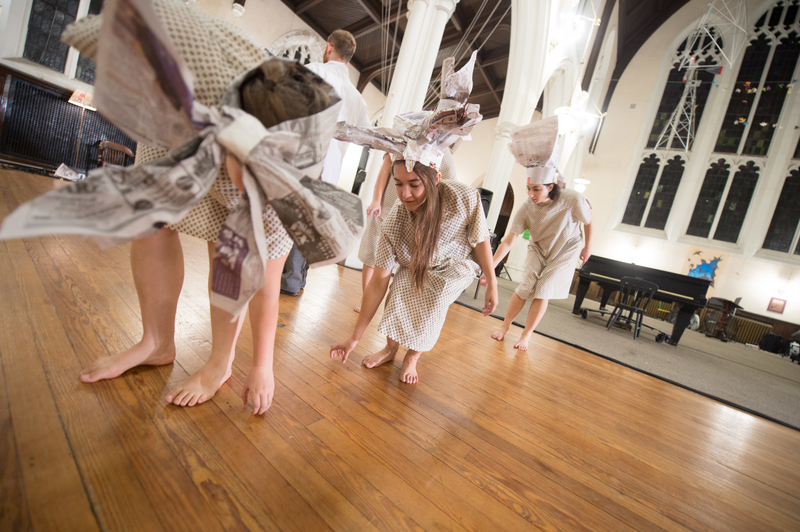 Nellie/Nellie was also entirely free to the public in the 2014 FringeArts Festival in Philadelphia, PA, through a collaboration with Broad Street Ministry at the downtown historic Chambers-Wylie Church. Yermedea Raw was presented free-of-charge in Providence, RI. Dear Diary LOL was presented free-of-charge in the 2017 FringeArts Neighborhood Festival. Led by Co-Artistic Director Francesca Montanile, the development and tour of Yermedea Raw was accompanied by workshops in Providence’s immigrant and refugee centers, through a collaboration with English for Action. Taught by Francesca and the ensemble, these workshops sought to give space to our participants to tell their own stories, before attending the performance for free in downtown Providence. Check out more about these workshops on the Yermedea blog.